Tunisia's capital is one of North Africa's most easygoing cities, yet still full of exotic appeal. It's this laid-back approach that makes Tunis the perfect introduction to the region. Most of the main sightseeing is in the medina (old town), which is a tourist attraction in itself. Here, the alleyways wind in higgledy-piggledy routes. Once amid the high walls, you're bound to get lost. Outside of this charming labyrinth, though, there are still plenty of things to do. The European style of the ville nouvelle (new town) is where French café culture sets the speed of the day, and sumptuous Belle Epoque architecture lines the ordered streets. Outside of the center are the city's two most important points of interest: The fabulous mosaic collection of the world-famous Bardo Museum and the remnants of once glorious Carthage are must-dos on every tourist's travel agenda. The remnants of ancient Carthage - fabled wealthy seafaring city of the Phoenicians - lie scattered across the Bay of Tunis. The evocative tumbled columns and piles of marble rubble are bordered by a panorama of the Mediterranean Sea, which was so fundamental to the city's prosperity. Completely destroyed in the third Punic War in 146 BC, the surviving ruins pale in comparison to some of North Africa's other ancient sites, but this doesn't mean you shouldn't visit. With their seafront setting, the ruins have an unbeatable, lost-in-time air. The separate sites are strung out along the bay area and can be easily reached by a mix of walking and using the Tunis Light Railway. Don't skip the views across the entire area from the top of Byrsa Hill. The world's most renowned mosaic collection resides in this opulent palace in Tunis. Along with Cairo's Egyptian Museum, the Bardo is one of North Africa's two top museum experiences. Inside, room after room exhibits gloriously intricate and still vibrantly fresh examples of mosaic art that have been unearthed from sites across the entirety of Tunisia. The Sousse Room, Odysseus Room, and Dougga Room have particularly impressive exhibits of this art form, but the entire collection is a treasury and is well worth an afternoon of browsing. The ground floor of the building holds some interesting non-mosaic exhibits with displays of the neo-Punic, Christian, and Islamic eras. The gorgeous Andalusian-style seaside neighborhood of Sidi Bou Said owes its fame to three young painters. While living here in 1914, Paul Klee, August Macke, and Louis Moilliet captured the beauty of its whitewashed buildings and blue doors on canvas. Sidi Bou Said has been something of a bohemian artists' quarter ever since and is a favored weekend hangout spot for Tunis locals. There are no tourist attractions as such (that's part of its charm), but you can't fail to be beguiled by the perfect white-and-blue streets, cliffside cafés, and picture-postcard shoreline. Chock-a-block full of crumbling buildings found by weaving your way through a procession of ever-skinnier alleyways, the medina (old town) district is Tunis' historic heart and is brimming with sightseeing potential. The main entrance gate, marking the end of the new city and beginning of the old is known as Bab el Bahr (Sea Gate). Built in 1848, it was known as Porte de France during the colonial period. The old town walls of the Hafsid period may have long ago disappeared, but once inside, mosques, madrassas (Islamic schools of learning), and mausoleums boasting opulent tile work and splendid Fatimid and Ottoman architecture line the twisting streets. Getting lost while meandering and stumbling onto some fabulous monumental relic is half the fun. Shoppers should head to Souk des Chéchias, where the makers of Tunisia's traditional woolen hats have had their workshops for centuries. 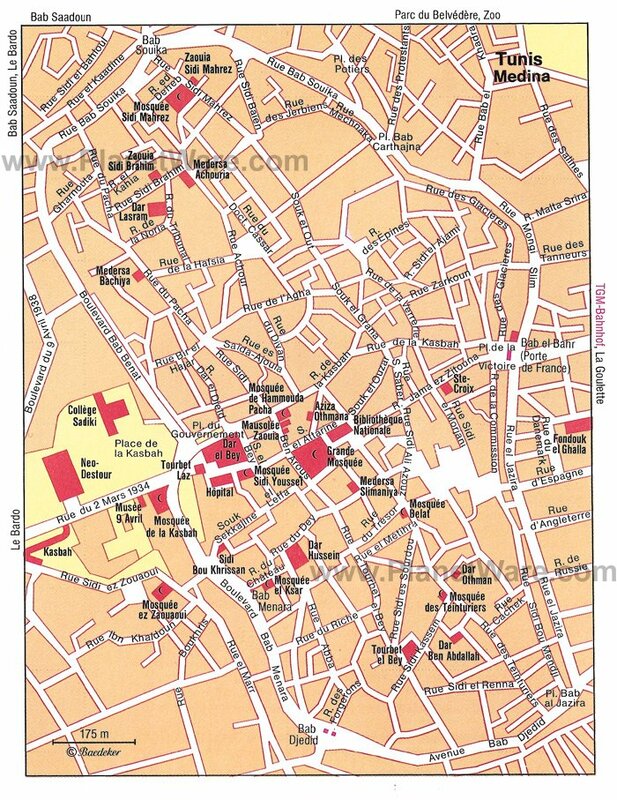 The area between Rue Djemma ez Zitouna and Rue Kasbah is where most of the souvenir stalls congregate. The medina district's great mosque is home to some of the country's finest examples of religious architecture. Begun during the Umayyad dynasty in AD 732, it has been added to and refined by conquering empires in the centuries since. Although non-Muslims cannot enter the prayer hall, visitors are free to wander around the opulent and tranquil exterior courtyard and also to head up to the rooftop, where dazzling tile work is on display. The rooftop is also one of the best places in the medina to get panoramic photographs of the area. A world away from the organic jumble of the medina, Tunis' ville nouvelle was developed during the French colonial era. Its main core is Avenue Habib Bourguiba - a magnificently wide avenue planted with palms and eucalyptus trees. The street heads eastwards, from just outside the medina on Place de l'Indépendance towards the harbor, in a dead straight line. The imposing St. Vincent de Paul Cathedral is the largest surviving building of Tunisia's French colonial period. Its bulky neo-Romanesque facade presides grandly over the north end of Place de l'Indépendance and at the time of construction in 1893, it was a monumental reminder of France's dominance over the country. Inside is the tomb of the Unknown Soldier. Architecture fans should check out the wonderful mix of colonial and post-colonial buildings along Avenue Habib Bourguiba, from the Modernist inverted pyramid of Hotel du Lac to the more genteel and grand European-style of the government buildings. At the intersection with Avenue Mohammed V, Place d'Afrique has a clock monument symbolizing Tunisia's modern era. La Goulette is the port suburb of the capital and has been a place of strategic importance (controlling the harbor entrance) since time immemorial. In the reign of Emperor Charles V, it was the most important Spanish possession in the eastern Maghreb. From 1574 onwards, the Ottoman rulers enlarged and strengthened the fortress built by Spain. La Goulette became a port only during the French colonial period, when the Lake of Tunis silted up and could no longer take ships of any size. For sightseeing, La Goulette has Spanish and Ottoman forts to explore and the gateway of the Old Arsenal (on the Tunis Road). If just soaking up the sea air is more your thing, the main coastal road (Avenue Franklin Roosevelt) is La Goulette's top promenading venue. Beyond the modern harbor, the long stretch of sandy beach is one of the city's top spots for evening and weekend relaxing. This Ottoman-style mosque is named after the 10th-century marabout (holy man) Mohammed Mahrez es Seddiki (the "Ascetic"), who is the Islamic equivalent of a patron saint for the city. It's a graceful building topped off with nine white domes. Mahrez played a vital role after the sacking of Tunis in AD 944, encouraging citizens to rebuild and to develop trade and industry. He is buried across the road from the mosque. Although non-Muslims cannot enter, the facade of the building is worth checking out while in the medina. The sumptuous Dar Hussein Palace was built in the 18th century and restored during the 19th century. Now home to Tunisia's National Institute of Archaeology and Art, visitors can wander freely in the beautiful inner courtyard (but aren't allowed into the palace itself) and soak up the opulent surroundings. Nearby is the Dar Ben Abdallah, an 18th-century palace that has been put to good use as the home of the city's folk museum (the Musée du Patrimoine Traditionnel de la Ville de Tunis). The exhibits include faience, stucco ornament, costumes, and furniture. This welcome splash of greenery is one of the city's top spots to catch your breath and regroup from the hustle of the busy streets. The hillside has been planted with Aleppo pine, carob-trees, olive and fig trees, and palm trees, and those who take the short hike up to the top of the hill are rewarded with fantastic panoramas of the entire city (on a clear day). On the east side of the park is the Museum of Modern Art, home to the country's top collection of work by Tunisian artists. The park is also home to the city's zoo. These two streets (and their surrounding alleys) in the medina are home to a wealth of architectural gems and are a wonderful place to capture a sense of what the old town would have looked like before modernization. The mid-19th-century Zaouia Sidi Brahim (Rue Sidi Brahim) is a showcase of sumptuous palace interiors, while 18th-century Dar Lasram (Rue du Tribunal) is another lavish example of palace style. The Ottoman pasha once resided along Rue du Pacha, and the houses that still line the lane host some of the finest examples of engraved wooden doorways in the city. Palais Bayram: luxury boutique hotel, steps from the medina, exquisitely restored 18th-century building, spa with traditional hammam. Hotel Belvedere Fourati: 4-star hotel, near Belvedere Park, modern decor, fitness center, free breakfast. Ibis Tunis: affordable rates, sleek decor, friendly staff, free parking. Hotel Metropole Residence: budget hotel, near the medina, friendly staff, clean rooms. Thanks to its superb location on a wide, sheltered bay and a fertile hinterland, the site of present day Tunis is one of the two oldest cities in the entire Mediterranean area. The first to settle here were the Numidians, who named their town Tunes. Afterwards, the Phoenicians founded Carthage near here in 814 BC. The rise of Tunis began with the final destruction of Carthage by the Arabs in AD 698. The Lake of Tunis provided a natural harbor for the Muslim fleet. Under the rule of Ibrahim II of the Aghlabid dynasty in AD 894, the capital was transferred from Kairouan to Tunis, and the town began to develop into one of the leading spiritual and intellectual centers of the Islamic world. In the 16th century, Tunis' prosperity attracted the attention of pirates, who captured and looted the town in 1534. In the following year, the Emperor Charles V drove out the pirates and Tunis became Spanish, though the administration remained in the hands of the ruling Hafsid dynasty. In 1569, the Ottoman Turks over-powered the Spaniards, but Don John of Austria in turn defeated the Turks. In 1574, however, the Ottoman army won back the town, and it became the seat of an Ottoman governor. In 1871, the Turkish Bey of Tunis, Hussein, declared himself independent of Constantinople, but the city (and country) fell under the colonial rule of France, which made Tunis an administrative center of their North African protectorate. 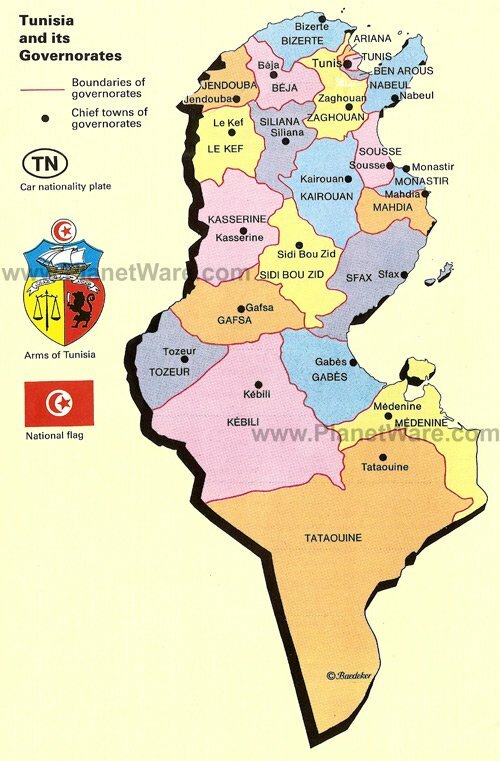 French rule finally ended on March 20, 1956 and in the following year, Tunis became capital of the Tunisian Republic.